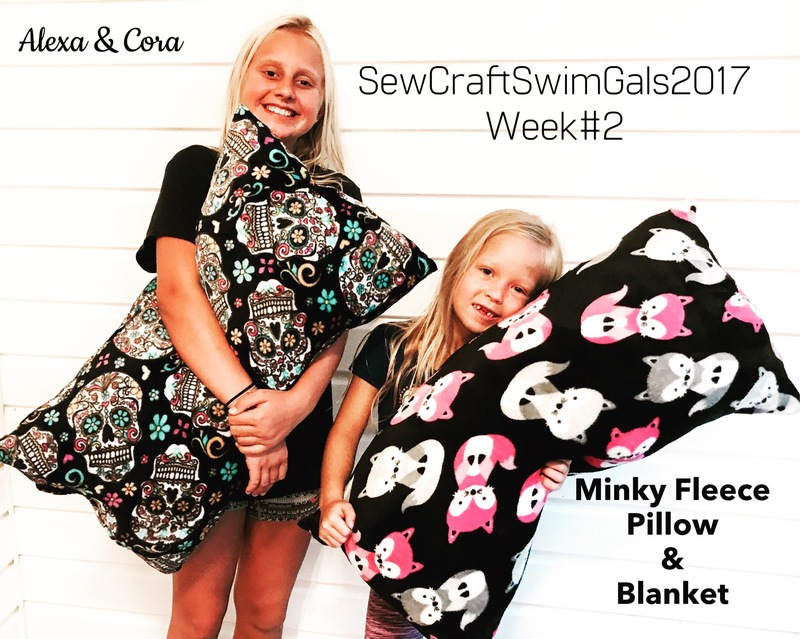 This weeks SewCraftSwimGals feature Alexa and Cora as they sew a quick and easy pillow and blanket made from a super soft and cozy Minky Fleece. Alexa and Cora purchased just two yards each of the Minky Fleece in really cute patterns. They opened out their fabric and left one long edge folded. Next they decided the size they wanted their pillows to be then simply cut them from one end of the material. Next step was turn the material they just cut for the pillow inside out then pin down all sides. The Minky Fleece is a bit slippery because it is so soft. So by pinning all sides it holds the fabric in place while sewing. Next step was to sew all the sides leaving a small opening large enough to insert the pillow stuffing. Once the pillows were stuffed to the girls desired firmness they stiched the opening closed. And that was it, the pillow was complete! The blanket was even easier. Simply zig zag stitch around all the raw edges and its done! Alexa and Cora absolutely love their new pillows and blankets! After completing their sewing project they made a cake that was decorated with crushed Flamin Hot Cheetos (a favorite of Alexas) Sounds gross, but wasn’t bad! A swim and some popscicles rounded out the day! Great fun! !